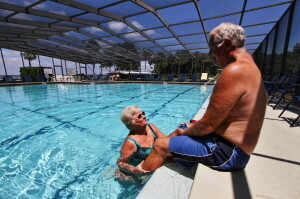 Lake Griffin Harbor in Leesburg epitomizes Florida retirement living. It is a 65-acre residential development that’s located on the southern shore of beautiful Lake Griffin, a community that is an excellent place to call home during your retirement whether you plan to live in Florida year-round or part-time. Lake Griffin Harbor’s outstanding location makes it the ideal community for retirees 55 and over who love to be in, on, or near the water. In addition to being a great bass fishery, Lake Griffin Harbor is a haven for boaters as it offers nearly 10,000 acres of glistening fresh water and access to the Atlantic Ocean through the Harris Chain of Lakes and the St. Johns River. It is paradise for those in search of an affordably priced retirement living community with a lakeside setting and lots of friendly neighbors. If you wish to learn more about Lake Griffin Harbor in Leesburg, FL, contact our retirement living community today.